Nomad bath-time in a New Zealand hotspring! Having never set foot in a campervan before arriving in New Zealand we initially found the whole experience rather bewildering. We finally picked a campervan after hours of research and dozens of Google searches to translate mysterious campervan lingo, only then to be faced with several bed assembly disasters, strange smells and midnight hunts for campsites! Was it challenging? Yes. Was it the best time of our lives? Yes! When you’re driving through some of the most beautiful scenery that exists in this world with your house on your back, camping under the stars and eating breakfast while dolphins frolic in the waves before you, you’ll forget all about yesterday’s battle with the waste disposal pipe. 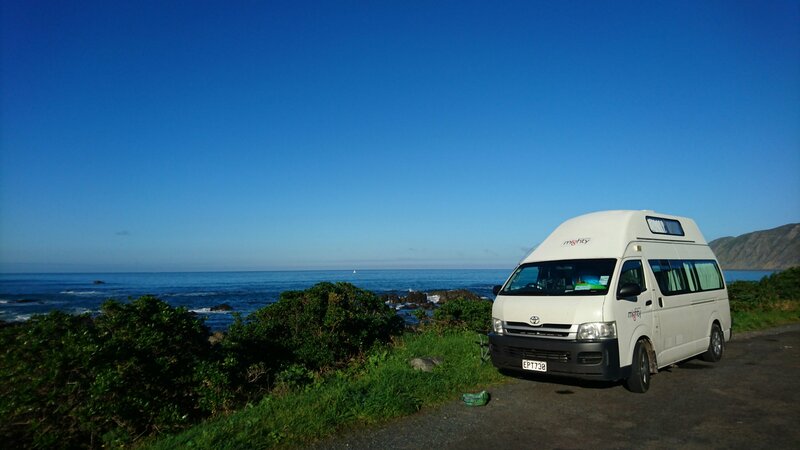 We’ve compiled our hard learned lessons, blood, sweat and tears into a handy little guide for other clueless first-time campers with everything you need to know about hiring a campervan in New Zealand. Campervans are big business in New Zealand so there are plenty of companies to choose from. One of the cheaper options is Wicked Campers who offer brightly painted, no frills vans aimed primarily at backpackers. At the other end of the scale is Maui whose all singing, all dancing, gadget filled motorhomes have every comfort you could imagine along with a hefty price tag! We opted for Mighty who sit in the middle along with Britz and seemed to offer the best cost to comfort ratio. When you’re picking your campervan, one very important question to ask yourself is: how well do you know your campmate? As, spoiler alert, campervans are small. Like really small! Our model, the Double Down 4YX, was actually designed for 4 people. I have no idea how 4 people could have squeezed into our camper unless they were a couple travelling with very VERY small children. The price difference between a 2 berth and 4 berth camper wasn’t huge so we decided to give ourselves more space which turned out to be a good decision as our camper was the perfect size for a couple. The Double Down also had an elevated roof so you could stand up inside and came equipped with everything we needed including a two ring gas stove, microwave oven, fridge and a surprisingly comfortable bed! Before embarking on our campervan adventure we naively thought we could just park up anywhere with a view. We couldn’t have been more wrong! Firstly, if your campervan has a fridge, lights or anything electric you’ll need to stay in a ‘powered campsite’ every 2-3 days to charge it up. This means paying between £18- £30 per night! Secondly, ‘freedom camping’ i.e. parking up anywhere you like, is illegal in New Zealand and carries an instant £100 fine if caught. Thirdly, unless you’ve splashed out on a fancy pants campervan with a shower and toilet on board, you’re going to need somewhere with facilities. Suddenly that budget-friendly campervan holiday is starting to look a little pricey! But don’t panic, we have some tricks and tips to share. 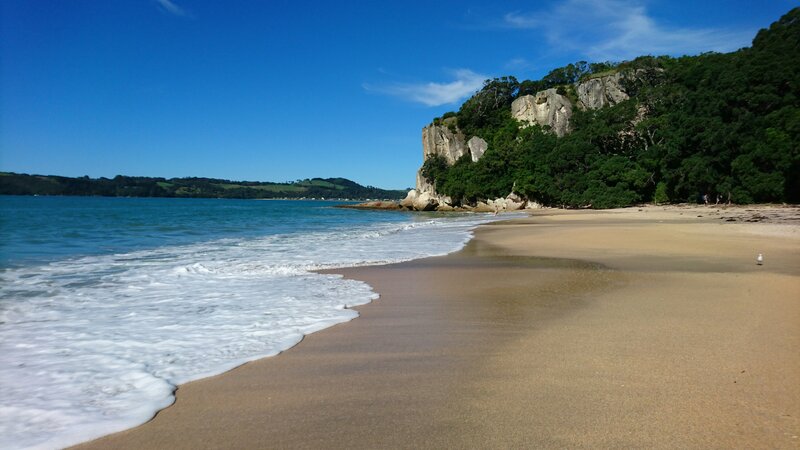 There are several good quality apps to help you locate budget friendly campsites in New Zealand. CamperMate was our favourite as it displays all available campsites in a particular area on an easy-to-use colour-coded map so you can see immediately how many sites are available, how much they cost and which are free or DOC run (see below). It also tells you what facilities they have and will direct you there via sat nav. You can also use the app to find petrol stations, supermarkets and toilets. There are a limited number of completely free campsites however these are usually restricted to ‘self contained’ vehicles which means campers with toilets on board. If you don’t have a certified self contained sticker on your window you might be turfed off as these sites are often patrolled. We didn’t know about this rule and were merrily tucking into dinner one evening when we had a knock on the door, sparking a midnight drive to find alternative digs. Free campsites located away from towns and cities tend to be less rigorously patrolled. Speaking (ahem) hypothetically, if you do want to take the risk and freedom camp then arrive late and leave early, as patrols tend to happen first thing in the morning and last thing at night. Aim for quiet country roads or laybys and leave nothing behind. Bike parks often have $2 showers and natural hotsprings make for a refreshing dip! 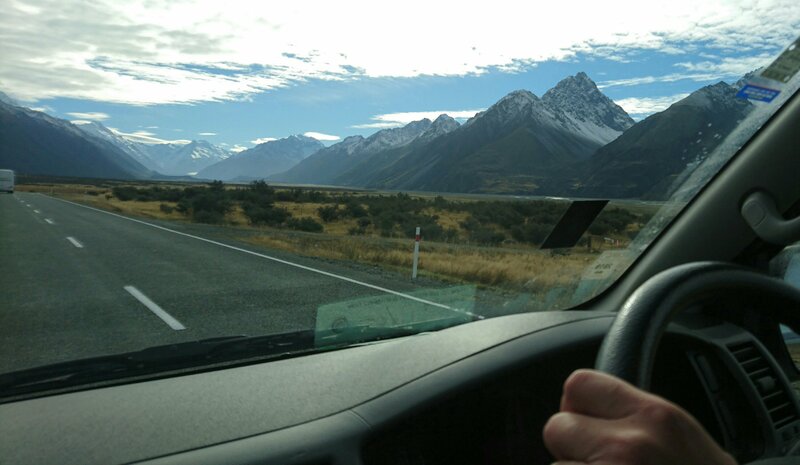 The scenery in New Zealand is utterly breath-taking, particularly on the South Island, so we really enjoyed the driving element of the trip. We had a month to cover both islands which was just about do-able and allowed us to see the key highlights and spend a couple of nights in each place. 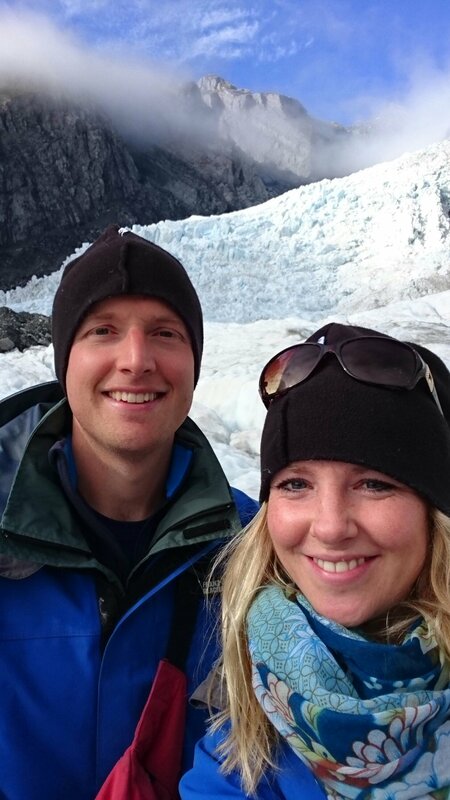 We wanted to have time to explore each destination properly and not spend our entire trip behind the wheel. We planned a route with destinations around 2-4 hours apart, so we’d have at least one full day in each place. 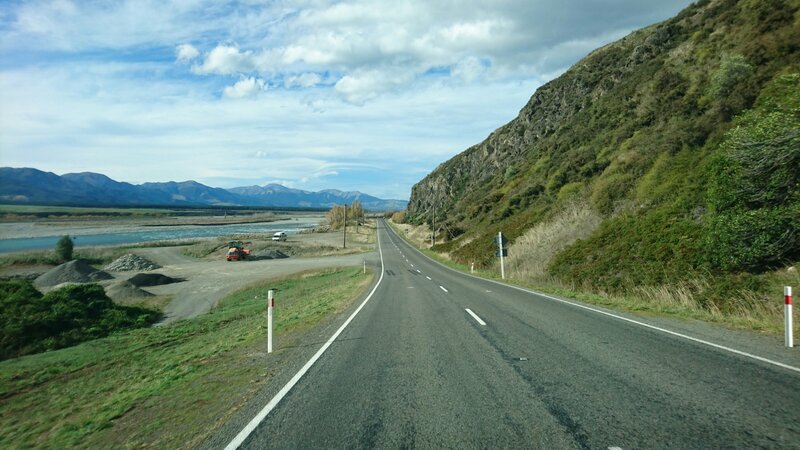 We did have a couple of longer driving days on the South Island but there are no shortage of stunning lakes and mountain views to break up the journey. We travelled around New Zealand in the Autumn from mid April to early May, so it was still warm in the North but starting to get chilly on the South Island, particularly at night. Our campervan came equipped with a portable heater but it functioned only when the van was hooked up to an electricity supply on a powered site to prevent the battery from being drained. So there were a few mornings when we woke up to see our breath hanging in the air! 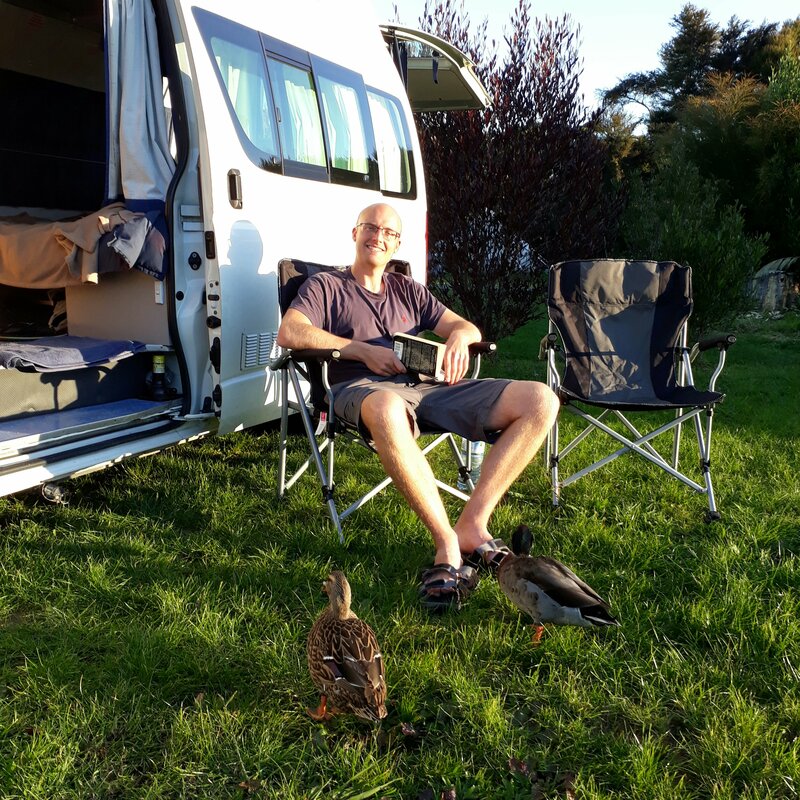 If you’re planning to travel around New Zealand in a campervan at this time of year we’d recommend stretching the budget to powered sites so you can use the portable heater or visit during the summer between December and Febrary. You will have to empty your waste tank periodically which, for a no frills campervan without a toilet, is thankfully just used sink water. You can do this at most serviced campsites in a special waste disposal area. It’s illegal to dump waste in an open environment (not to mention irresponsible and antisocial) and can result in fines of up to $500,000! So get to know your dump sites! 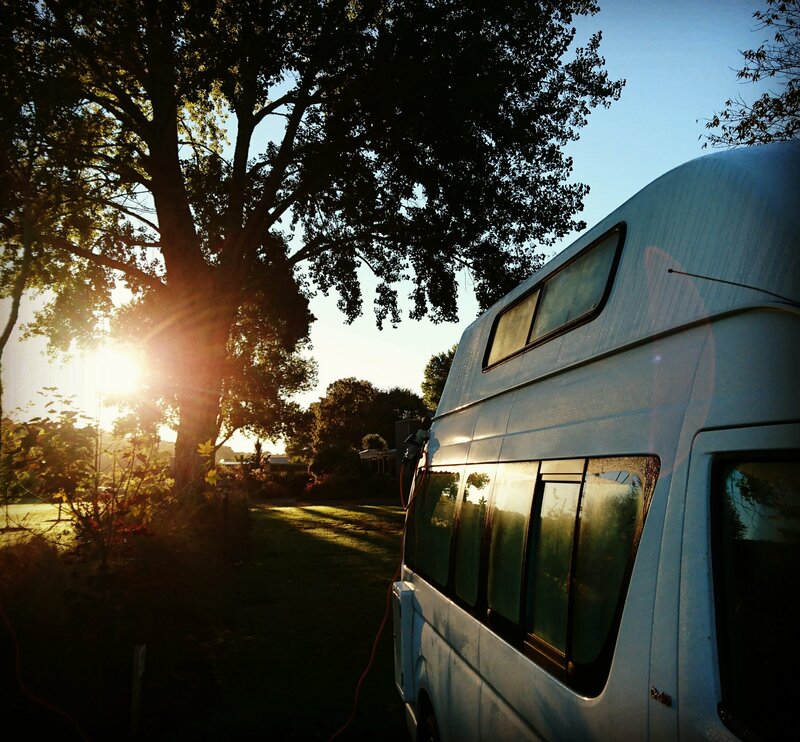 Most basic campervans will only send power to internal plug sockets when hooked up to a powered site or when the vehicle is moving. So remember to charge phones and cameras on the move. New Zealand discount supermarket chain ‘Countdown’ has stores scattered across both islands in most towns and cities and was our go-to for budget friendly campervan meals. 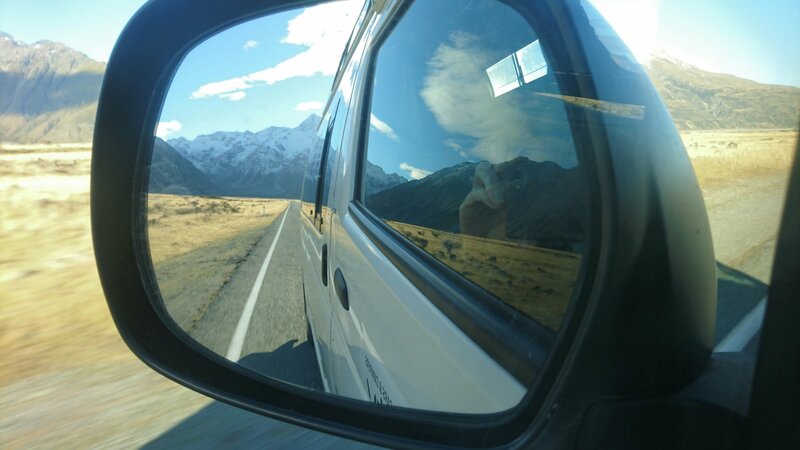 So there it is: a beginner’s guide to travelling around New Zealand in a campervan! If you have any tips or stories to share from your own New Zealand road trip we’d love to hear from you! Just post a comment below or drop us an email! Happy camping everyone! Your hours of research, hard learnt lessons and blood, sweat and tears will spare other first-time campers all the pitfalls and leave them free to enjoy New Zealand. The vivid description and stunning photography is amazing! A great blog. Such a lot of tips and advice – it will save lots of time and effort for future campervan travellers. Perfect! I’m doing this in March 2018 (just the North Island), so thanks for the blog! Will definitely bookmark for later.